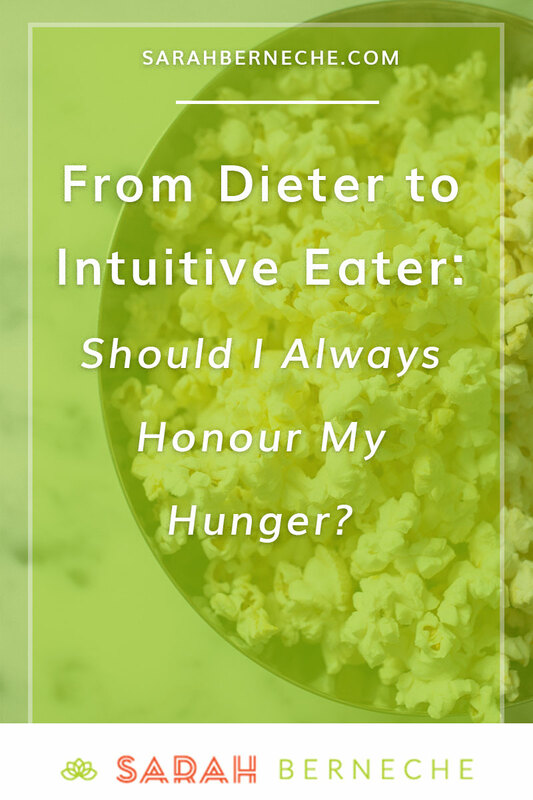 From Dieter to Intuitive Eater: Should I *Always* Honour My Hunger? Moving from dieting to intuitive eating can be fraught with all kinds of confusion and challenges. While dieting encourages you not to listen to your hunger — just drink water, right? — and to actively suppress it using all manner of things, intuitive eating is all. about. listening. But…should you always honour you hunger, Sarah? In short — yes. Yes, yes, yes. Diet culture teaches us that our appetites can’t be trusted. Whether it’s carbs, macros, calories, sugar, fat, “clean foods”, and the like, we’re constantly being told what to do (um, bossed around) — and constantly left questioning whether we’re doing “it” right. Dieting really complicates eating, transforming everything we’re doing with food into a conflict to be resolved. And semi-starving us all the while. Eating actually doesn’t have to be so hard. While hunger is a meaty topic that could easily cover several blog posts, I do want to illuminate the following today: your hunger is natural, healthy, helpful. Even if it doesn’t always seem that way. Honouring hunger is fundamental to feeling sane around food. For most of us, we breathe consistently without any work on our end. We don’t have to try, or think about it. We just do. Our detoxification organs are always working for us, whether we realize it or not. And our hunger? It lights up when our energy stores are low and we need more food. Hunger varies. Sometimes you’ll be super hungry, and sometime less so. Sometime the reason will be apparent — and sometimes not. Sometimes you’ll need three snacks, and sometimes your three meals might be enough. So…how do you work with hunger instead of against it? Unsure of what hunger feels like? Let’s chat. Will Intuitive Eating Stop My Sugar Cravings? COPYRIGHT © SARAH BERNECHE NUTRITION 2019. Branding by jack ngan. headshot photography by Rachel Callan Photography.